I was looking at movies based on Sport and Seven Days in Utopia was one of Netflix’s suggestions. Not really a good one but nevertheless, I watched it. 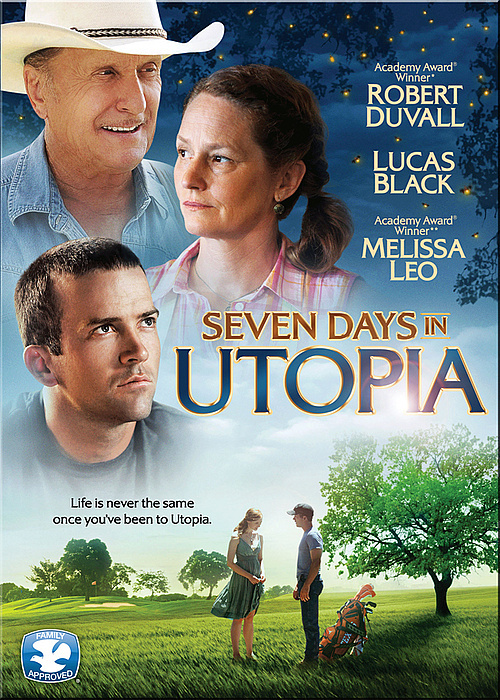 Luke Chislom (Lucas Black) was devastated after he made a disastrous debut at a golf open, and lands in Utopia. He meets an old man, who helps him repair his car. Luke finds out that Johnny (Robert Duvall) used to be a pro golfer himself. Johnny proposes that Luke stays in Utopia for 7 days and get his act together. Luke accepts the offer and Johnny makes him go through a series of activities in the beginning, none of which related to golf. Lesson 1. Fly-fishing. When I saw that, I was like seriously? I’m not golfer myself, so I did not understand the connection. Another lesson included painting, where Luke channels his thoughts on how he would score and brings it out in a picture. As he goes through these lessons, he learns something new not about golf but about life. The ending had a twist which was quite surprising and that was the best part, I would say. Overall, a so-so movie but is pleasing for the eyes. I don’t find golf an enticing sport and maybe that’s why I did not enjoy the movie. Golf lovers out there may enjoy this, but for me it was just another flick where famous guy enters small town and transforms himself into a completely new person. Confidence comes in being prepared. You again is a film about people caught up in their high-school world. Marni (Kirsten Bell) is one those glass-with-braces-plus-acne high school kids who gets bullied by Joanna (Odette Annable). High school has passed and everyone has moved on. That’s what we would imagine. Marni is now promoted as a Vice-president at her PR firm and doing well for herself. 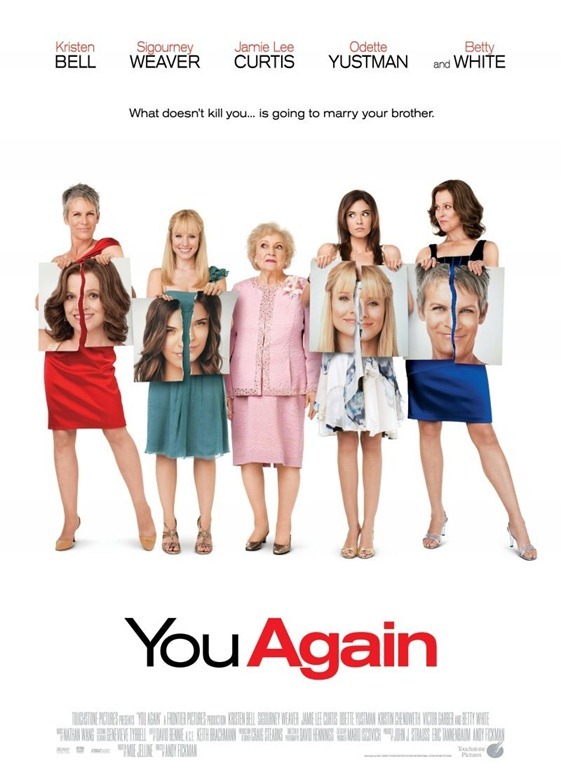 As she heads back home for her brother’s wedding, she speaks to her mother (Jamie Lee Curtis) and finds out that Will (James Wolk) is marrying Joanna. The high school feelings creep up for Marni as she returns home to find out that everyone has warmed up very well to Joanna including her grandma (Betty White). What’s even more surprising is Marni’s mom, Gail finds out that Joanna’s aunt, Ramona was one of her competitors in high school. The movie then revolves around Marni trying get a good apology from Joanna about what she did to her in high school and proving to her brother what a phony she thinks Joanna is. Overall, I thought the movie was predictable. You know how the movie is going to proceed and how it’s going to end. The movie kept bouncing between emotions and some silly comic moments. What doesn’t kill you…is going to marry your brother. I was looking to review a foreign language film and I found this Italian film: Bread & Tulips (Pane e tulipani). I did not realize how old this movie was until I saw the cell phones that they were using! Oh, and don’t worry, the movie comes with subtitles on Netflix. A bored housewife, Rosalba (Licia Maglietta) is on a trip in Greece with her family and gets left behind by their tourist bus. She decides to wait for her family to come and fetch her but in turn they get stood up by her! Thinking that she would back go to a quiet house, she hitchhikes a ride back home and get her alone time before her family arrives. And now you can see a pattern: she ditches that idea too and lands in Venice! As she looks for a place to stay she meets Fernando (Bruno Ganz) at a restaurant and becomes a guest at his house. She meets her neighbor, Grazia (Marina Massironi) a fun massage therapist who becomes her best friend in town. The film picks up some pace when her husband sends Constantino (Giuseppe Battiston) to look her. The movie is filled with a series of random fun events and is great for the eyes as it’s set in Venice. If it hadn’t been for that, I would have found it just long and boring. It’s not a story that you haven’t heard of before, so don’t watch the movie expecting something surprising. A good pick for the die hard romantics, the ones who are head over heels in love with Venice and those who love some soothing Italian music. Others, it’s not for you.